Obesity continues to be an increasing epidemic in the United States. An abundance of evidence shows that obesity is caused by a combination of a sedentary lifestyle and poor nutritional habits consisting of high-fat and high-glycemic carbohydrates. However, additional factors play a role in obesity, including the improper balance of hormones and diets consisting of foods that cause inflammation. Inflammatory foods may contribute to excess fat accumulation in the abdominal region. Most people associate inflammation with pain, swelling and redness due to an injury or infection. This is the immune system’s normal response when injury or infection occurs. New research shows there is a second type of inflammation known as low-grade inflammation or silent inflammation. Current research is focusing on the relationships between diet, inflammation and chronic diseases such as heart disease, diabetes, arthritis, Alzheimer’s disease and certain types of cancer. Since there is no pain associated with silent inflammation, it sometimes goes undetected for years, causing detrimental damage to organs. The typical American diet currently consists of an increased consumption of refined carbohydrates and foods high in omega-6 fatty acids, and a decreased consumption of foods high in omega-3 fatty acids. • Diets that are high in refined carbohydrates are those carbohydrates that have a high-glycemic index and quickly raise insulin levels in the blood. Refined carbohydrates consist of mostly white bread products, rice and potatoes. • Diets high in omega-6 fatty acids also contribute to this condition. Some vegetable oils are high in omega-6 fatty acids. The main component in omega-6 vegetable oils is linoleic acid. • The combination of refined carbohydrates and foods rich in omega-6 fatty acids increases the production of arachidonic acid, leading to silent inflammation. • The consumption of foods high in omega-3 fatty acids by Americans has progressively declined over the years and this contributes to the rise in silent inflammation. • Diets that promote inflammation also tend to consist of a hormonal imbalance. Insulin, the major hormone associated with excessive fat and obesity, and leptin, another hormone associated with hunger, are both contributors to silent inflammation. The most productive way that people can become proactive in decreasing the amount of arachidonic acid in their body is to eat an anti-inflammatory diet. Dr. Barry Sears, creator of the Zone Diet, states that cellular inflammation is the cause of weight gain and obesity. Dr. Sears attributes cellular inflammation to the increased development of many chronic diseases. The most popular anti-inflammatory diet, the Zone Diet has been proven to reverse cellular inflammation by maintaining the balance of the inflammatory hormones. His dietary program encourages people to divide their plates at every meal into three equal sections to assure the correct ratio of omega-3 and omega-6 fatty acids and the balance of the inflammatory hormones. One-third of your plate should contain approximately three ounces of low-fat protein. Dr. Sears suggests that the amount of protein be equal to the palm of your hand. The remaining two-thirds of your plate should contain colorful carbohydrates, such as fruits and vegetables. Dr. Sears also recommends adding a small amount of fat that is low in arachidonic acid and saturated fats, such as olive oil. The general guidelines for an anti-inflammatory diet include: eat plenty of fruits and vegetables, eat a good source of omega-3 fatty acids, eat whole grains such as brown rice and bulgar wheat, eat lean protein sources such as chicken, cut back on red meats and dairy products that are not low fat, minimize trans fat and saturated fat, avoid fast food and processed foods, limit alcohol consumption and add spices to your meals such as ginger and curry. The question by many regarding an anti-inflammatory diet is in regard to the percentage of macronutrients needed throughout the course of the day. The National Academies’ Institute of Medicine suggests that adults consume 45 to 65 percent of their calories from carbohydrates, 20 to 35 percent from fat, and 10 to 35 percent from protein for healthy eating. The fat content for an anti-inflammatory diet should stay within the recommended range but should be low in arachidonic acid and saturated fatty acids because of their ability to promote inflammation. Olive oil and nuts are both excellent choices for fat in an anti-inflammatory diet because both contain low arachidonic acid and saturated fat. The amount of low-fat protein should be no more than 20 to 30 grams per meal, with the higher values for men and lower values for women. 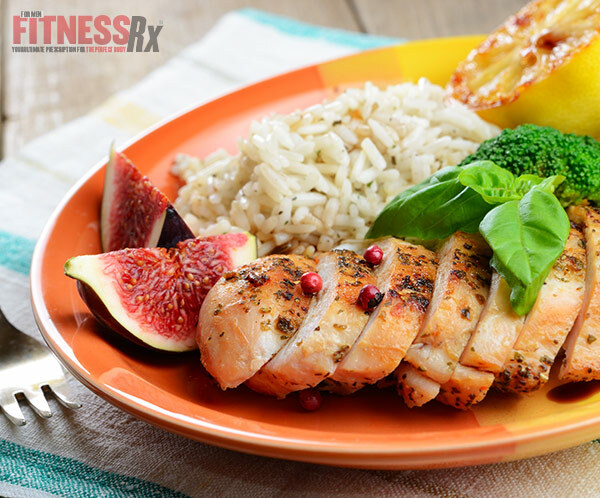 Meals that contain less than 20 to 30 grams of low-fat protein may not stimulate protein synthesis and thermogenesis. The focus of the carbohydrate content is to maintain stable insulin levels between meals. The total carbohydrate content of each meal should be no more than 40 grams of low-glycemic carbohydrates. A diet that consists of low-glycemic carbohydrates will lessen the risk of inflammation. Since the timing of meals should center on balancing hormones, you should space your meals two to three hours apart. This will also maximize the metabolic aspects of your food intake and contribute to weight loss. Eating the five to six smaller meals throughout the day will increase thermogenesis, a process that requires the use of energy. The body actually burns calories while it is digesting food. This is why body temperature sometimes increases while eating. Spacing your meals two to three hours apart will also help to balance blood sugar levels and prevent hunger attacks. • Supplement with EPA and DHA, but make sure they do not counteract any medication you are taking such as a blood thinner or diuretic. Obesity is oftentimes attributed to the lack of knowledge of the proper nutrients to consume and what percentage of those nutrients should be consumed. It is also caused by the unawareness of which foods cause silent inflammation and which foods control inflammation and appetite. Diets that are high in the consumption of foods that promote inflammation can cause excess fat accumulation in the abdominal region. Abdominal obesity is the most dangerous type of fat because it increases your risk of chronic diseases such as hypertension, metabolic syndrome, type 2 diabetes, high cholesterol, coronary artery disease and premature death. Implementation of an anti-inflammatory diet will not only prevent silent inflammation, it will reduce your risk of these chronic diseases and help maintain a reduced weight or stimulate weight reduction. Florence, M., et al. Arachidonic acid and prostacyclin signaling promote adipose tissue development: a human health concern? Journal of Lipid Nutrition, 2003; 44:271-279. Lawren, W. & Sears, B (1995). Enter the Zone: A Dietary Road Map. New York: NY Harper Collins Publisher. Lomangino, K. Anti-inflammatory diets: science or sales pitch? Clinical Nutrition Insight, 2009; 35: 1-5. Savvas, S., et al. Association of adipose tissue arachidonic acid content with BMI and overweight status in children. British Journal of Nutrition, 2004; 91:643-649. Sears, B. Anti-inflammatory diets for obesity and diabetes. J. Am. Coll. Nut., 2009; 28(suppl): 482S-491S. Sears, B. & Ricordi, C. Anti-inflammatory nutrition as a pharmacological approach to treat obesity. Journal of Obesity, 2010; 2011: 1-14.